Miami Springs will always have a prominent place in history books — and not just for golf. MIAMI SPRINGS, Florida – The first thing you notice are the trees. The Miami Springs Golf & Country Club has lots of great big ones, and there’s a reason. 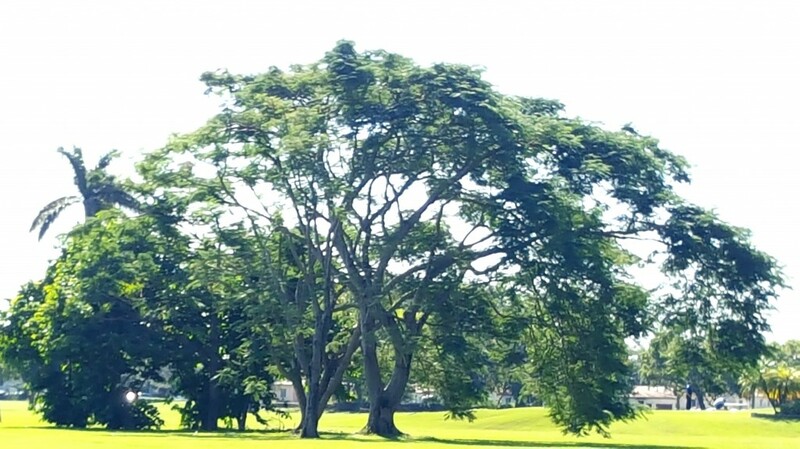 Trees played a big part in the design of this, arguably the most historic 18 holes in Florida – a state with over 1,300 courses, more than any other in the nation. Unlike many of the old courses, both in Florida and elsewhere, many of the original trees were allowed to grow at Miami Springs. Over 70 were lost during Hurricane Irma in September, but not the controversial one blocking the green at the par-3 twelfth hole. Many of the course’s regular players were hoping that tree would have blown down, but it’s still standing. Miami Springs is located beside the Miami International Airport and is just two miles from the famed Trump National Doral Miami resort and spa. Much to the credit of its operators, Miami Springs’ layout wasn’t seriously altered over the years. 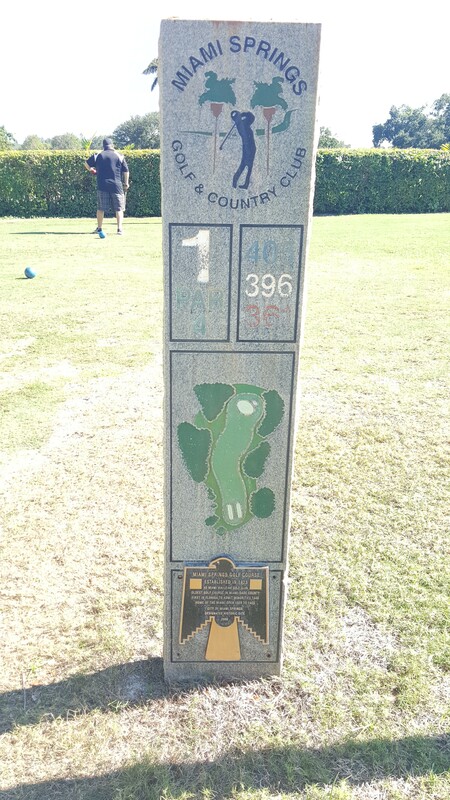 It still plays at 6,755 yards from the back tees, just like it did during its 30 years as the home of the Miami Open and the 34 years it hosted the North & South tourney – the largest minority-sponsored golf competition in the United States. Miami Springs was the first Florida course to admit minorities, in 1949. Those were just the biggest of many big events held at Miami Springs. If only those trees could talk, they would have some interesting stories to tell. As it is, the operators of the course have thankfully embraced the course’s rich history. Its well documented on the course’s website. Massive tree like these are the trademark at Miami Springs. Many are over 90 years old. The present ownership, the City of Miami Springs, has a friendly staff and that adds to the good vibes you get when you visit the place. 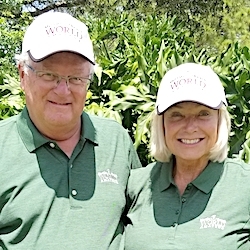 It starts with the waitress in the small but neat dining room and the starter at the first tee, who is quick to extol the course’s charm, and it extends all the way to the guy greeting us in the parking lot after our round. He wanted to sell us clubs and was reluctant to take no for an answer, but he eventually did with a smile on his face. We were paired with a caddie from Doral and a young local who was well versed on the public courses in the area. Miami Springs is one of their favorites. It’s not just the course, either. Miami Springs also has the only lighted grass driving range within 25 miles. From a historical perspective, Miami Springs isn’t the first course in the area. There was a six-hole layout at the Royal Palm Hotel in 1897 and Henry Flagler opened nine holes at the Miami Country Club in 1898. 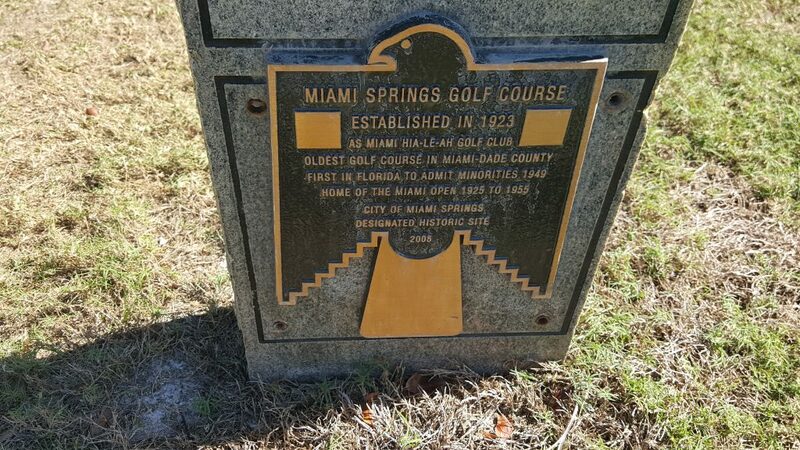 Miami Springs developed from the enthusiasm of a group called the Miami Coconuts, a group of businessmen who loved golf but had no place to play. 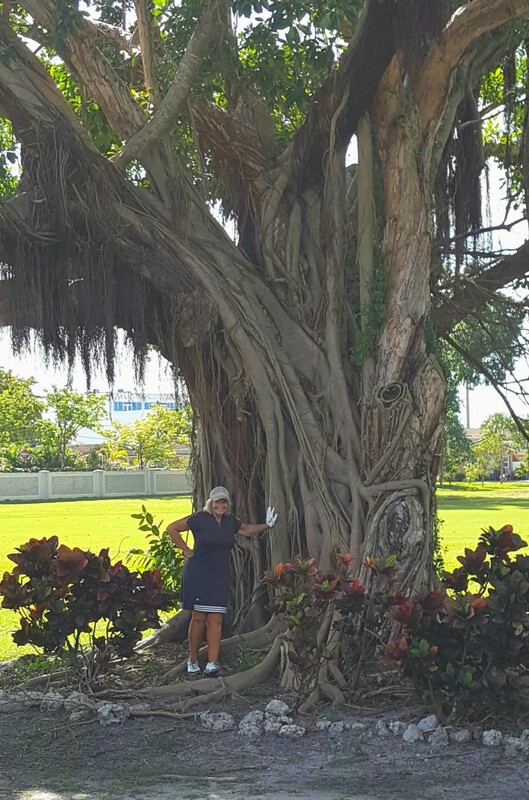 This massive banyan is the most memorable of the trees adorning Miami Springs. 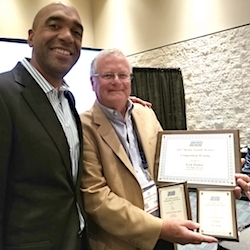 Tubby Smith, the leader of the Coconuts, was editor of The Southern Golfer. Some historical accounts claim that he designed the course in 1922. The more widely held belief is that a respected Chicago architectural firm, William Langford and Theodore Moreland, did the work. At any rate, the course — built for $101,000 – opened as Dade County’s first municipal course in 1923 under the name of Miami Hialeah Golf Club. It was originally owned by the City of Miami, which kicked in $3,000 for prize money to create the first Miami Open in January, 1925. The event drew all the great players of the era. Cyril Walker, the reigning U.S. Open champion, was there along with Walter Hagen, Long Jim Barnes, Jock Hutchison, Tommy Armour and Gene Sarazen. The reigning British Open titlist, Abe Mitchell, led wire-to-wire in winning the $600 first prize, however. For the next 29 years the Miami Open was a sports highlight in south Florida. Sam Snead won it six times, including the last staging in 1955 when rain shortened the event from 72 to 54 holes. On the champions wall in the clubhouse he’s even listed as “Sammy Snead’’ in the early references. The Miami Open became an official PGA event in 1945 and was held in January as the traditional kickoff to the circuit’s winter season. In 1955 it was shifted to December dates with a $12,500 prize fund and still drew 25,000 spectators. That, though, turned out the end of a great run. The PGA required a $15,000 purse the next year, and the City of Miami refused to pay it. Not only that, but the governmental body deemed the Miami Springs clubhouse an unsafe structure and burned it down in a fire drill. 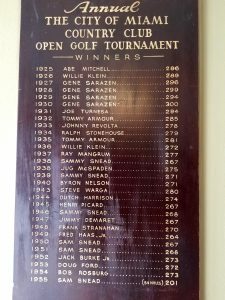 Looking back at the Miami Open years, the tourney became a milestone when Arnold Palmer made it his first professional event in 1955, a year after winning the U.S. Amateur. He shot 78-74 and missed the cut by six strokes but Palmer returned to tie for eighth in the tourney’s last staging a year later. While the Miami Open was the main event, Miami Springs also hosted a second PGA event during those years. The Miami Four Ball was part of Byron Nelson’s record 11 straight victories during the 1945 season. 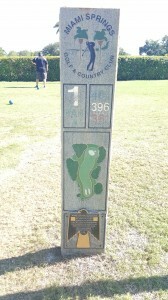 Modern tee markers contrast with Miami Springs’ rich past. With the PGA gone Miami Springs hosted the Major League Baseball Players outing from 1956-67 along with the North and South event. Those events brought such luminaries as Mickey Mantle, Yogi Berra, Jackie Robinson, Althea Gibson, Nat `King’ Cole, Sugar Ray Robinson and Joe Louis to Miami Springs. Seven years after the last Miami Open the PGA Tour established another longstanding tournament in Miami. Doral, with its Blue Monster course, hosted tournaments for 55 straight years until sponsorship problems led to the circuit putting a tournament in Mexico in its place on the 2017 schedule. So now Miami is without a PGA Tour event? That doesn’t sound right. Doral, with its four 18-holers, will likely host big tournaments again. Miami Springs, most likely not. Still, it was at Miami Springs where Florida’s rich golf history really got its start. 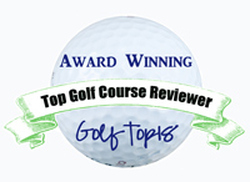 That’s why it deserves such a prominent place among the 53 courses listed on the Florida Historic Golf Trail. 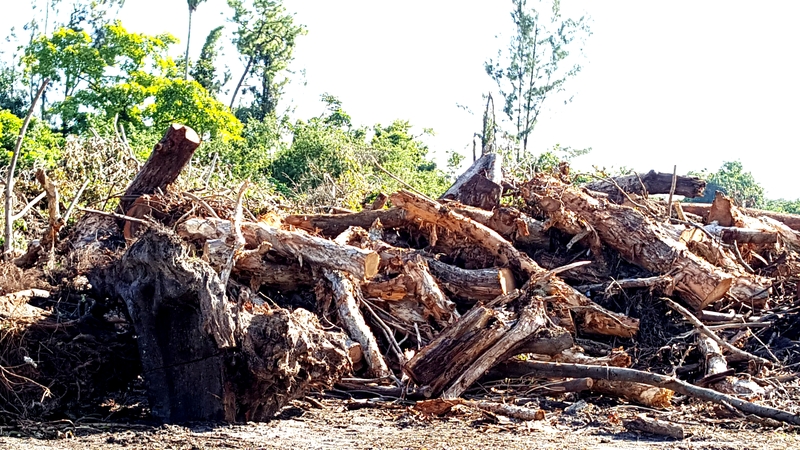 Two months later remnants of Hurricane Irma were still present at Miami Springs.